Aquanique 2300 GPH Waterfall Pump | Fountain City Art Ctr. 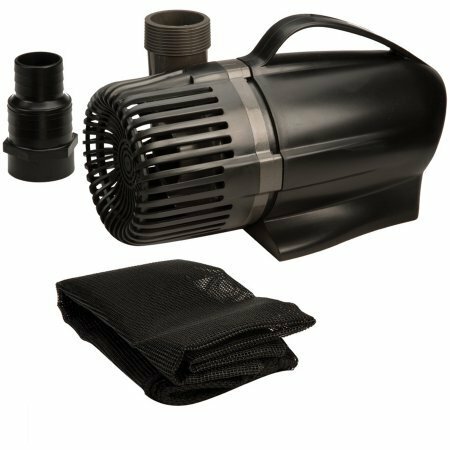 The Aquanique 2300 GPH Waterfall Pump is designed to run quietly. It provides a strong and consistent flow for your water feature. It is designed for waterfalls up to 10 feet in height. This energy-efficient pump is long-lasting. It has a ceramic shaft that reduces friction while in operation, so it's made to last. It comes with a free mesh barrier bag to keep large, unwanted debris from entering the motor. This device is designed for freshwater use only. When not in use during the winter months, it is recommended that the unit be stored indoors. This will allow it to last longer. This oil-free pump has a 16-foot cord so that you have room to place it farther away from the sink. It fits both 1-inch and 1.5-inch tubing. Enjoy your fish and other freshwater creatures. This pump will make the tank easier to take care of and help your pets live a longer and happier life. It is safe for both fish and plants so you can enjoy a variety of aquamarine life. The unit is incredibly efficient, as it filters 2,300 gallons of water per hour. It is also powerful, with 65 watts and 1 amp. If you have any questions about this product by AQUANIQUE, contact us by completing and submitting the form below. If you are looking for a specif part number, please include it with your message.